Hot-Up is a unique spray adjuvant that contains wetters, ammonium sulphate and mineral oil in an easy to mix and stable formulation. Unique blend of nonionic surfactants, ammonium sulphate and mineral oil in a stable, ready to use formulation. For use with knockdown herbicides in non-crop situations. Will assist in wetting and spreading of herbicides on weeds. Reduces hard water degradation and alkaline hydrolysis of certain herbicides. Increases penetration of herbicides through waxy weed cuticles. Delays the dry down rate of spray droplets on weeds. Enhances the performance of certain combinations of herbicides. 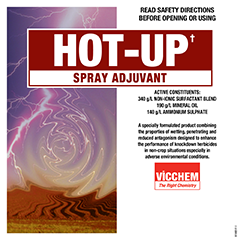 HOT-UP is a multi-functional adjuvant designed for use with knockdown herbicides. It is this unique combination of surfactants, ammonium sulphate and mineral oil in an easy to mix and stable formulation that provides HOT-UP with its range of exceptional properties. HOT-UP combines the properties of surfactants, ammonium sulphate and mineral oil, all of which are known to provide adjuvancy to knockdown herbicides under certain conditions. (B) coverage of the herbicide on the weed surface due to enhanced wetting and spreading. HOT-UP enhances herbicide performance on hard to wet weed surfaces. 2. Ammonium sulphate protects certain herbicides eg. glyphosate from being deactivated in hard water. For optimum results it is necessary to add HOT-UP to the water prior to adding the herbicide. Ammonium sulphate can also assist in the uptake of herbicides into the weed and their translocation to the active site. HOT-UP enhances herbicide performance in hard water. 3. The mineral oil will act as an anti-evaporant slowing the dry down rate of the spray droplet so that the herbicide has a longer time to enter the weed. It will also assist in the modification of the weed’s protective cuticle thereby increasing herbicide penetration. 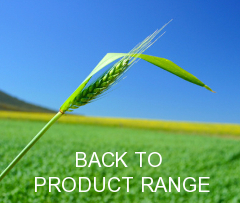 HOT-UP can enhance herbicide performance during hot weather. 4. HOT-UP will buffer the pH of spray water to approximately 7.0 which is neutral. This will help to reduce degradation of the herbicide due to alkaline hydrolysis which can occur when the water’s pH is greater than pH 7.0. HOT-UP is designed for use with non-selective herbicides in noncrop situations only. HOT-UP use rate : 0.25 - 1.0 L / 100 L of Spray Volume. When using a herbicide that can be degraded by hard water (eg. glyphosate), it is advisable when using hard water to add HOT-UP to the spray tank before the herbicide, to reduce herbicide loss. Trials and compatibility studies have shown that HOT-UP is an excellent adjuvant for use with knockdown herbicides particularly when hard water is used and/or the air temperature is high. HOT-UP is suitable for mixing with a wide range of knockdown herbicides and can enhance the performance of certain combinations of herbicides. Important: Always refer to labels for detailed directions.